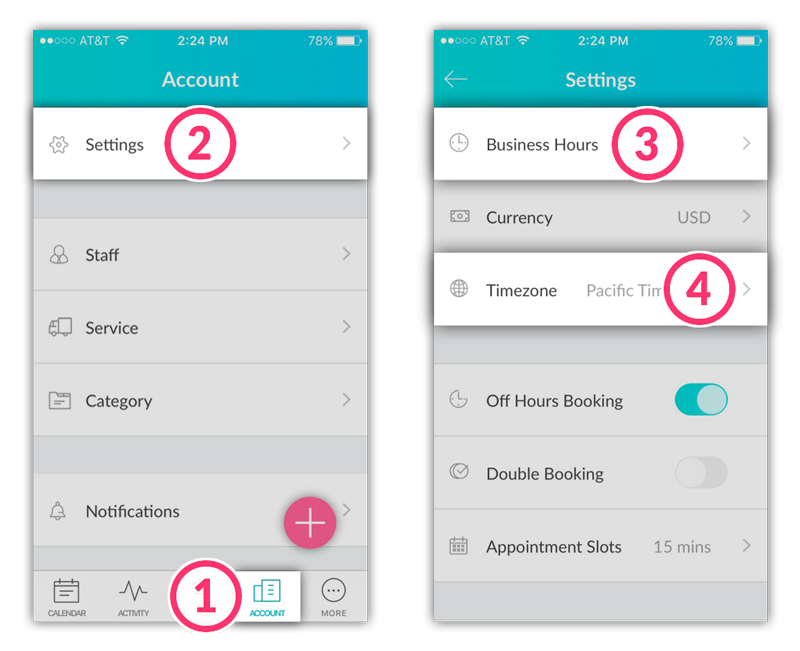 Time settings ensure that your appointments and reminder notifications get booked & sent at the right time. Typically you'll set your business hours when you sign up for a new Setmore account, and your timezone is pre-set based on your browser settings. If you need to change either for any reason, you may do so using the instructions below. 1.) In the bottom navigation menu, tap the Account button. 2.) In the Account menu, tap Settings. 4.) Tap Timezone to adjust your account's timezone. 5.) 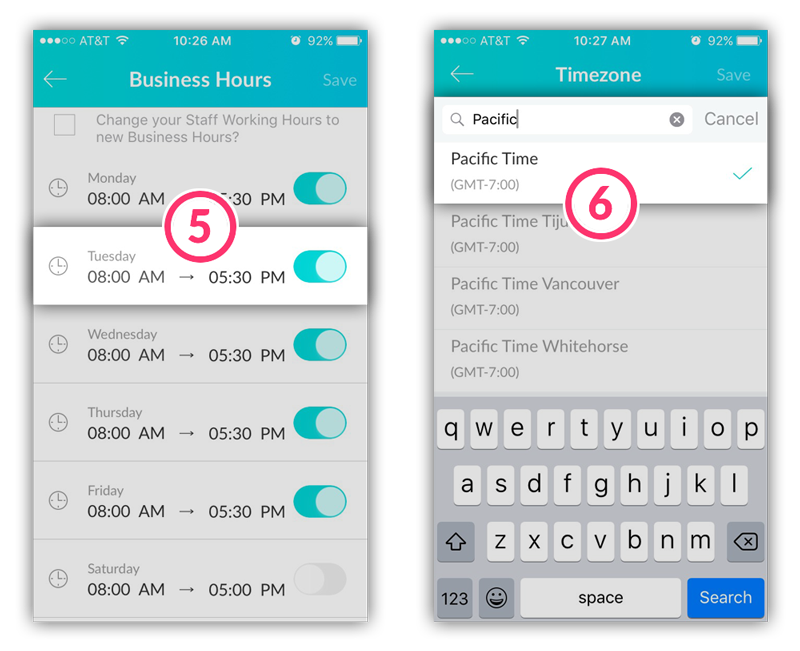 When adjusting your business hours, tap on the On/Off switch to activate the day, then tap the day of the week to adjust the Start and End times. When everything looks good, tap Save in the top-right corner. Note: You can change all staff hours to conform to the updated business hours by checking the box “Change your staff working hours to new business hours?” at the top of the window. Otherwise you will need to manually adjust staff working hours in each staff profile. 6.) When changing your timezone, tap the search bar and enter the first few letters of your timezone (note that all timezones are spelled out, so please avoid using acronyms such as PST or EST). Tap to place a checkmark next to your timezone and then tap Save in the top-right corner. Your Setmore Booking Page will automatically convert available timeslots into the customer's timezone, based on the customer's browser settings. However, if the majority of your customers are all in your timezone, you may want to disable this feature. You may only perform this action from the full browser or downloadable version of Setmore. Read the article here to learn more.